Webpage Nepal is professional IT services and solutions Company located in Pokhara, Kaski, Nepal, providing high profile services at competitive rates. We are a fast growing website design company that develops high-end internet portals and websites used by hundreds of thousands of people around the world. 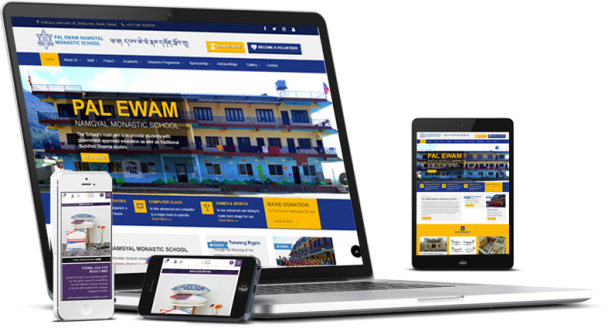 Webpage Nepal is the leading web design company offers professional website design and development services, custom web application development and custom eCommerce solutions. We are the web designing/web development professional with excellent graphic web designing skills complying to W3C standards. Our talented team of dedicated professionals will bring together your vision and ideas into reality with creativity, technology and marketing. Webpage Nepal has been involved in diverse types of design and development projects including content management, social networks and eCommerce implementations. Our services span all aspects of website design, online marketing and customized application development for clients based on their requirements and area of operation. We offer enterprise solutions for all business processes that can be customized as required. Our aim is to deliver customer satisfaction by providing value-added, innovative and technically superior solutions to clients and help them improve their business processes. We’re Affordable: Our streamlined website development process and highly skilled website designers allows us to provide our professional website design at very competitive rates. We are Friendly: Most of our clients have fun working with us. We make the web design process easy and pleasant. We’re Honest: Our business has grown word-of-mouth and we intend to continue growing this way. We’ll treat you fairly and do a great job so that you’ll want to continue working with us after your site has launched. And, we want you to tell all your friends and colleagues about us. We Emphasize Simplicity: Some firms love to build complicated sites. Not us. We choose the simplest tool that will effectively accomplish a task. Simple sites load faster, are easy to use and are less prone to problems. We Build Powerful Websites: If you need a site with all the bells and whistles, contact Webpage Nepal. Database integration, video, audio, ios and android integration, e-commerce – no problem. You’re the Boss: We’ll give you options and the tools and information to make good choices. We’ll give you our recommendations, but ultimately, every decision about your website is yours. You will Love your Design: Our number one focus when we design your new website is to make sure you love it. We work together with you to come up with the perfect website look and feel that best suits your business. You know your business, your customers and your branding better than anyone so we make sure you are involved every step of the way. Our costs are based on time, and it depends what you need, but, we always deliver the best possible value for money. Contact us for a chat, there’s no obligation! Do i need to buy my domain? If you don’t own a domain already you’ll need to buy one. However, if you would rather hand the task over to us, you are more than welcome. We’ll always make sure the domain is registered in your name and to your business. Web hosting can be daunting, who to choose, who to trust? These are questions we all face. Your website needs a stable, reliable and dependable host, where all your files are safely stored and accessed by potential clients, customers and general users. We can recommend a website hosting company for you, a company we trust with our own website. You can host your website via us if you’d prefer and you’ll enjoy professional, reliable and secure service 24/7 with our trusted partner. Yes. We can provide any level of redesign, from a change of underlying architecture and the addition of a Content Management System (CMS) or e-commerce / community building facilities to giving your site a new fresh and up to date look. We can also convert your site to be ‘responsive’, i.e. adapt in size depending on viewport used which means it will look great on iPhones and other smartphones, iPads and other tablets as well as laptops and desktops. The majority of websites we build are on WordPress, which is a Content Management System. This allows you to edit pages, publish new posts and create users so your whole team can edit your website. Do you offer entry lever/start up packages?